Born in Busto Arsizio on 29/05/1990. 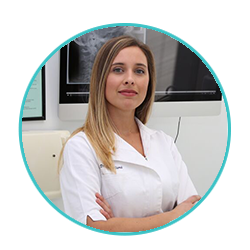 After graduating from the Arturo Tosi High School in Busto Arsizio (VA), she enrolled at the ICOM, the International College of Osteopathic Medicine. She completed her studies in 2014, obtaining a diploma in osteopathy, issued by ICOM and M.Sc. Ost. (Masters in Science of Osteopathy) released by the Surrey Institute of Osteopathic Medicine (SIOM) at Nescot through the University of Surrey. She spent 3 years internship at the ICOM Clinic, and one year of internship in Pediatric Osteopathy. She attended sveral courses, including: theoretical-practical course of neuromuscular bandage and basic course R.M.P. (functional rehabilitation and posture) held by Dr. Silverio di Rocca (dentist) and D.O. Angelo Cardone (osteopath). She also obtained the title of Massotherapist (MCB) at Ecolife, Milan. Currently tutoring in Pediatric Osteopathy at the ICOM Clinic, and assistant in the Cranio-Sacral Osteopathy course at ICOM (International College of Osteopathic Medicine). She currently works as a freelancer in Busto Arsizio and for BDD Dental Clinic, Alzaia Naviglio Grande 38, Milan.